There is something magical about walking through a beautiful setting with a group of friends in silence. Silence is something we experience less and less in this noisy world. When we walk in silence we can experience the gift of peace and can access a deeper part of ourselves to gain wisdom that we can't easily hear in our daily life. Let's take time and spend it together - in the quiet stillness. 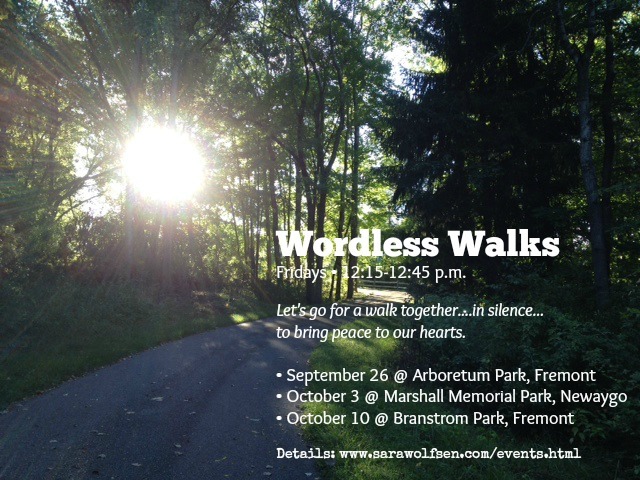 We will gather as a group then walk silently at our own pace through the path. At the end of the path we will gather again briefly before we go our separate ways feeling calmer, more connected to ourselves and our natural world, and ready to take action from a place of peace. Dress in layers, wear sturdy, comfortable shoes and bring a water bottle. Register using the RSVP form below. Friday, October 3, 12:15 p.m. at Marshall Park, Newaygo - CANCELLED DUE TO WEATHER! Sara Wolfsen, Certified Health Coach.